My Blog Feeds Moved - Nothing much changes though! I've been loving Feedburner ever since I started to use it. I started to use Feedburner after Google acquired the company in June 2007 for an estimated $100m. Needless to say, the Google+Feedburner combination has always interested me from both performance and feature set perspectives. However, even though the acquisition had taken place two years back, there has been no migration of feeds to a Google platform till the recent past. Recently Google started to move Feedburner feeds to its own platform, and I've got a lot of reminders to move my feeds too. Finally, after several reminders, I just finished moving my blog feeds from Feedburner to Google. The reason for not moving thus far has been for the very reason of not wanting to move and risk losing some valuable subscribers. But I'm sure Google has worked out things well...and the transition seems to happened very smoothly. Should you have trouble receiving my posts, I request you to wait for a week's time. Should you still not receive updates, do drop me a note! My feeds link has changed from http://feeds.feedburner.com/KarthikVijayakumar to http://feeds2.feedburner.com/KarthikVijayakumar. The "feeds2" is the only change. Still, the old link should be redirecting you to my new link. You can still continue subscribe to my posts by email through the "Subscribe via Email" links on my blog or by visiting http://feedburner.google.com/fb/a/mailverify?uri=KarthikVijayakumar. To all who've been struck by the Cupid, Wish you a Happy Valentines Day!! To all who've spent the night staring at your UNIX screens, Wish you a Happy 1234567890 Day!! Have a fun-filled weekend and Stay Inspired! Running in Chennai - When, What, Where, How? Many people have asked me about running in the city of Chennai, and I've tried to give them the right information. In this article, I thought of putting down my thoughts on this subject - I hope it will be useful for many in the days to come. Firstly, I'd like to give a little information about the city of Chennai. Chennai is located in the state of Tamilnadu in India. Chennai is a pretty big city and is one of the metros in India. The climate is more tropical and the temperatures average at about 30 degrees Celsius annually. The humidity averages at about 70% and the day gets pretty busy by about 7:30AM. The traffic is pretty high during the day time with the peak hours being 8:30AM-11:30AM and 5:00PM-7:30PM. The atmosphere gets pretty polluted...especially during the peak hours. The roads in the city are pretty wide in most places, but you are sure to bump into some pot-holes in many roads. The city enjoys summer from early-March to mid-August in reality with the peak summer falling somtime in the second half of May. Temperatures during summer can average at 37 degrees Celsius, and can go as high as 44 degrees Celsius during the peak season (second half of May). The city enjoys rainfall from mid-September to early-December (or late-November), and the roads get pretty much flooded with puddles of water. The winter season is during the months of December to early-February, when the temperatures can fall as low as 20 degrees Celsius. Chennai is a city that loves sports of all kind. The city has one of the best cricket teams with equal excellence in the sports of football, hockey, kabaddi and field atheletics. Running has been a much appreciated sport with a big number of atheletes into short distance running. There are big organizations like the YMCA and SDAT which have extended unrelenting support to this sport through the years. Chennai Runners is the biggest running club in the city, and with more than 600+ members, this club has been doing extensive running programs ever since 2006. I strongly urge you to visit www.chennairunners.com to know more. As you would have guessed by now, Chennai is pretty tropical and humid most part of the year. Should you want to run in the city, I strongly urge you to carry a bottle of water or a fuel-belt. With the sun up and shining by 7AM, I strongly urge you to do early morning runs. 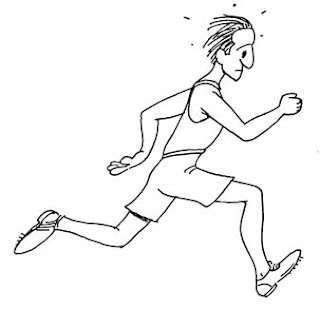 Ideal time to start your run will be at about 4:30AM or 5:00AM, if you plan to do longer distances (>10-15kms). Also, use a good non-greasy sun block (with SPF of 30+) is advisable to avoid su burns. Chennai also has a lot of stray dogs, but with an increasing number of runners hitting the asphalt, these dogs seem to have got used to seeing people run and hence don't get into your way! In terms of the apparel, a good running tee that breaths is something that will keep you cool and comfortable during your run. A dry-fit tee is what I would strongly recommend. With the city traffic being high, it's a good practice to run on the right side of the two-way roads...against the traffic. Should you want to find out good running routes, do visit www.chennairunners.com. Also, if you are looking for a group to run with, you should join the Chennai Runners' Google Group and get updates on our regular runs! Keep Running 'n' have Fun! Stay Fit 'n' Healthy! As I write this article, my clock shows 9:06AM on Thursday the 12th February Indian Standard Time. In just about a day, 19 hours and 54 minutes from now, the UNIX time will equal '1234567890'! So, what are you waiting for? Folks in India should plan to extend your Friday night party to the early morning hours and have your UNIX screen displayed on a large 75mm screen and see the time tick 1234567890!! Probably a toast to in the name of 1234567890 would get the promoters of this unique day (Colin and Andy) a greater reason to celebrate! Advanced wishes for a Happy 1234567890 Day!! (Aint this sound 'cooler' than the much beaten Valentines Day!?!) Have Fun!! Found this apt in an environment like that of today - A recession hit world where companies tend to give additional responsibilities (originally done by someone who is fired without notice!) to existing employees who don't have a clue of what needs to be done. PS: Incidentally, a friend of mine was recently subjected to the a situation very similar to what Dilbert is subjected to in the above cartoon strip by Scott Adams! Auroville Marathon - Here I come! Wow, its been ONE FULL YEAR since I did my first official half marathon. I did my first half marathon in Chennai on 10th February 2008, and the Auroville half marathon on 17th February 2008. These two runs tipped off a great (and eventful!) running year 2008 from me. I've been doing lesser and lighter runs ever since I did my Singapore marathon in December last year. And now, I've planned to kick-off this year's runs at the second Auroville Marathon that's happening on the 15th February 2008! I'm running a half marathon at Auroville this time too. Though there are multiple reasons for one to run the Auroville marathon, to me, its more to do with the place itself. The serene and pristine surroundings in Auroville is something that has to be experienced. The place (and its people) had created a magical spell in me last year, that I decided to start my 2009 runs at Auroville. There are many things special about the Auroville marathon. But personally, I enjoyed the unique pasta party, the fruits and fresh lime juices on the run, the ride to Auroville from Chennai with my Chennai Runners friends and the awesome foot massage after the run. But this time, I have been pleasantly surprised by a very unique aspect of Auroville marathon - I gotto "pick-n-choose" my BIB number!!! No, I'm not kidding. Thanks to my Chennai Runners friend Balaji, I got a VIP privelege to choose my BIB number. Balaji has been based out of Auroville for sometime now, and has been assisting Chandresh with the organization of this marathon. Thanks, Balaji! Chandresh, who has been the key organizer of the Auroville marathon, had done a tremendous job last year. The organization was by far the best I've seen for a first-marathon! Chandresh is a long distance runner and a marathoner himself, and I'm sure he put himself in the runners' shoes before chalking out the route and organizing the run. Chandresh - I'm looking forward to a wonderful time at Auroville! Having been running very scantily since my Singapore marathon, I'm looking to take the Auroville one pretty easy with the focus just being the completion (in a decent timing). I'm going to be running for Asha this time too. So, do contriute to my run and join hands in educating several underprivileged children in this country.